Over the past 4 years we have advised and supported hundreds of DJs. 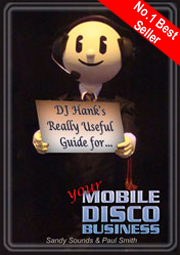 So, on the suggestion of a number of AMPdj members, We have collated and expanded these Infomails, adding new chapters too, into my eBook; 'DJ Hank's Really Useful Guide for Your Mobile Disco Business'. It is aimed at DJs of all levels and expertise to give you ideas on ways to develop, promote and focus on your mobile disco business. We sincerely believe that the advice contained in this book will benefit mobile DJs everywhere; from those just starting out through to the veterans who are still keen to learn. It includes many gems of information which will either add something new to your business and performance or reinforce your current practices. Many of us started DJing as a hobby and from a love of music. Many of us have also recognised that our 'hobby' is a viable business opportunity too. With this in mind, we take an in-depth look at the rudiments of your business from your overall image through to the mechanics of running a business. Chapters include defining your business image and branding, business cards, essential paperwork, specialising and developing your business, and the dreaded self-assessment tax return. Marketing is a very important part of running a business. It is the process of letting potential clients know you are there. We take a close and in-depth look at various marketing strategies to enable you to write a comprehensive and effective marketing plan for your mobile DJ business. Both online and offline marketing techniques are covered. This section covers websites and emails together with advice on grammar and punctuation. We also cover the use of pictures and videos on websites and a section highlighting potential online problems and ways to solve them. In the previous sections we've concentrated on generating interest and, ultimately, enquiries. Using the results of our own survey over the last four years from thousands of clients, we take a closer look at how to convert those enquiries into bookings. Here we take a break from the nitty gritty business side and look closer at ourselves as DJs and business owners. We analyse our performance both in the office and at the venue. No DJ book would be complete without looking at the tools of our trade. Here we cover imaginative set-ups and keeping your equipment running. Health & Safety is a major consideration for anyone running a business, especially a service type industry that centres around dealing with the general public. We look at keeping both the guests and yourself safe and claim free. For many years, AMPdj have been avid supporters of four charities, so it seemed fitting to donate and share all profits, yes ALL profits, from this book to the following charities. Having three members in AMPdj reliant on a guide dog to lead full and active lives, and run their mobile disco business, we have experienced first hand the valuable work this charity does. The training, of both the dog and the recipient, is amazing. Couple that with a complete after care programme, Guide Dogs need all the support they can get to be able to continue this invaluable work. In our line of work, hearing loss is an occupational hazard. There are numerous DJs who suffer from tinnitus (constant buzzing in the ears) caused by exposure to loud music. Action on Hearing Loss do a lot of work with DJs, even attending the BPM show each year at the NEC Birmingham. They advise on how to protect our hearing, whilst still doing the job we love. MS is a complex neurone condition that affects sufferers in a variety of ways including mobility, vision and fatigue. Having two children (both in their twenties) with this condition and knowing other members of AMPdj or their families who are affected, we appreciate the work this charity does with both support and research. If you know someone who has been diagnosed with diabetes, you'll know what a life changing condition it can be. This is where Diabetes UK comes in. Not only do they do invaluable research into the cause and the control of it, they also provide much needed support, advice and help to sufferers with the condition. Again, some of our AMPdj members are personally affected! By purchasing this book, you will not only be supporting four fantastic charities, you will be in possession of a manual that could enhance and help you develop, promote and improve your mobile disco business. DJ Hank has been really busy recently and is proud to announce that his new book is now available. You can also read what DJ Hank has been up to recently in the next edition of Pro Mobile magazine out in July and follow him on YouTube. Discounts and free CD exclusive to AMPdj members from CD Pool. Also discounts from AVSL, Emulator, Party Directory and many more. "You cannot open a book without learning something"